It's On: The OBLSK Horizon. OBLSK has been way busy in the last two months working with amazing clients and producing spectacular media and marketing. We are really excited about these upcoming Summer months as we have a few sculptural projection installations that will seriously blow the top off any steamy kettle. Be sure to keep a look out to the OBLSK horizon and we will award you with eye candy as well as interesting dialogue material. 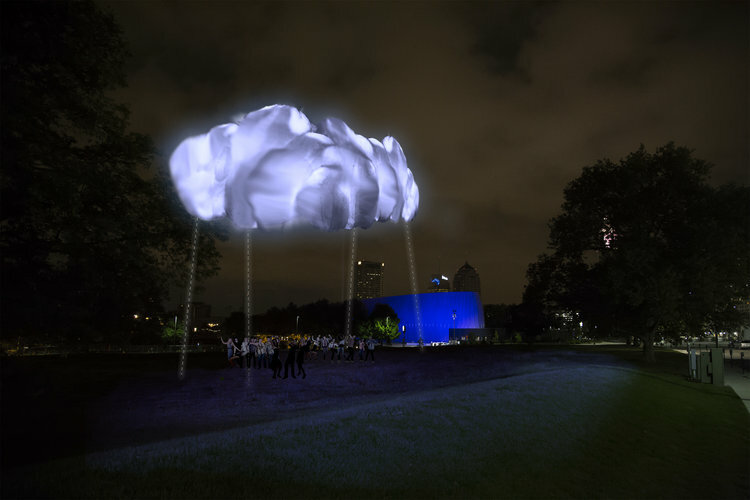 This Summer OBLSK is engineering an interactive glowing RainCloud for the Independent's Day Festival this September 16th-17th. This Sculpture will be one of our largest endeavors involving Helium, Cotton Candy, Wetlands, Rain dances, Thunderstorms, Petrichor, Performances, and Water Workshops. Keep tuned! we will be updating often! For more info on the Raincloud project visit. For the May Franklinton Friday, OBLSK tested out a new projector by projection mapping onto the Chromedge studios in Franklinton. We had a blast creating textures, optical illusions, and color landscapes that illuminated the evening for the public's pleasure. Thank you Chromedge for being an awesome host! OBLSK was invited in May to travel to Sloatsburg, New York. (yes that's correct, there is a city called Sloatsburg) to work with ZenGenius gurus Justin Kornicki and Addie Addison in producing a Webinar Series for HMS Host. This series has been a blast to make as it has all been done with stop motion animation and a few five-fingered characters! ZenGenius is an international visual merchandising/events company based out of Columbus, Ohio. Their work has received numerous awards including the Wow award for their work at the Connie Hilton event, OBLSK produced this award winning video! Check out this cool company and the amazing work that they do! JMKW Development is a construction company based out of El Paso, Texas. They specialize in commercial construction and industrial development. They are finding a niche in sustainable building practices (YES!) and OBLSK has been hired to create their image. OBLSK Team member and web designer Marque Reavely designed their website and OBLSK also writes the informative and inspiring articles for their "News" Section (that's our unbiased opinion, ha ha!). This new company is authentic and talented.